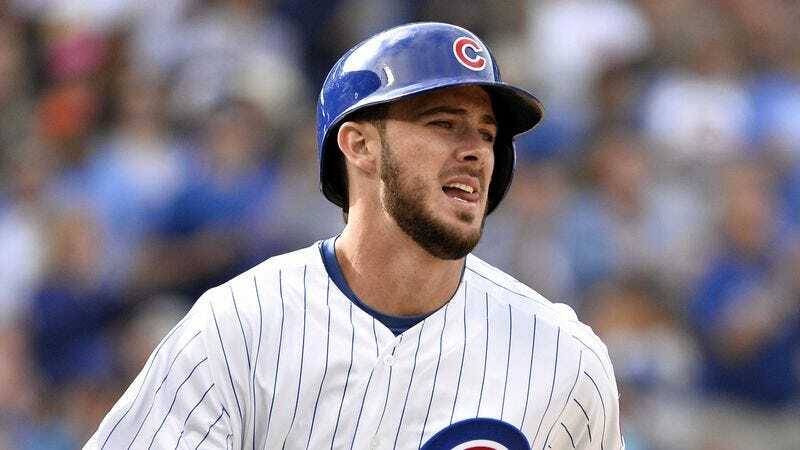 CHICAGO—Describing the sickening sight and stench of the carcasses that have become a constant presence around the clubhouse, members of the Chicago Cubs admitted to reporters Tuesday that they have become increasingly unnerved by third baseman Kris Bryant’s repeated attempts to break the team’s so-called “Curse of the Billy Goat” by slaughtering goats. “I know he thinks he’s doing it all for the team, but his fixation with finding and killing all of these goats is starting to get out of control,” said first baseman Anthony Rizzo, adding that Bryant, who has killed an estimated 30 goats since the playoffs began, has disgusted teammates with rituals that include sprinkling powdered goat horn inside the batter’s box and storing severed goat heads in the dugout’s helmet rack. “It’s kind of scary how seriously he takes it, like the way he freaks out whenever he can’t find his goat bone necklace or whenever somebody interrupts him while he’s disemboweling a calf in the clubhouse. He even dipped everyone’s socks in goat’s blood before last night’s game, and then after we won, he said he had to go blow up a goat in his backyard to make sure we clinch the series. This man needs help.” At press time, sources confirmed that the Wrigley Field grounds crew was scrambling to remove a decapitated goat dangling from the right field Jumbotron before Game 4 of the NLDS.